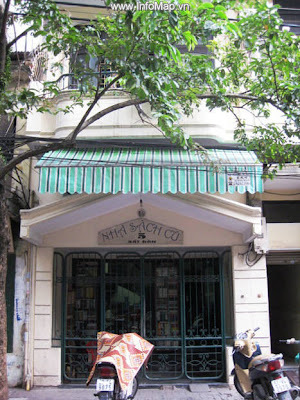 The bookstore is located on Bat Dan street in the Old Quarter, between the equally narrow Duong Thanh and Hang Ga streets. It is not an unknown store, for, in addition to having already discovered several blogs and articles related to the shop, after talking with the owner I came to know that it is a frequent stop-in point for international scholars such as Cornell professor Keith W. Taylor, beloved by many Vietnamese academians I've met. Mr. Phan Trác Cảnh proudly listed to me additional countries such as China, Korea, Japan, England and France whose citizens have browsed his shelves. I first arrived to a thick green iron gate and felt a sinking feeling as I thought that this may be one of those unpredicatble times that no one was home. I asked a man eating soup next to the entrance if anyone was there, he pointed to a doorbell, I pushed it, and about one minute later a girl of about 12, who I later assumed to be the owner's granddaughter, timidly answered. She very politely and quietly led me up a steep and nearly endless staircase to perhaps the 4th floor, dusty cardboard boxes lining the walls of the hall every which way. I reached a sunlit study with a balcony and a view, it was a beautiful day to mix the sun, the breeze, and books. When I met him, the owner was wearing a crisp white collared shirt, an ash grey tailored vest and black pants. I greeted him in Vietnamese to let him know that he could speak freely and without the silent, friendly gestures that are typically used to communicate between people foreign to each other's native tongue. "Hello, have you ever been here before?" "No not yet. I heard about your store through a website on the internet and so I've come to look for some books about culture, history, literature. Anything in Vietnamese, English or French is okay with me." "Please sit down. You can give me the names of titles or authors and I 'll tell you if I have them or not." "Well, right now I'm researching about the poets Xuan Dieu, Huy Can, Xuan Quynh, Nguyen Binh but generally speaking, books about culture, literature, and history in Vietnam is what I'm looking for"
"I've got everything here; over there are volumes of Han Nom studies, below that is poetry, I've got books on ethnic minorities, those books over there are in French. Take a look around..."
The room is not too big, but from floor to ceiling there are books, and yes, the store lives up to its name; they're old. 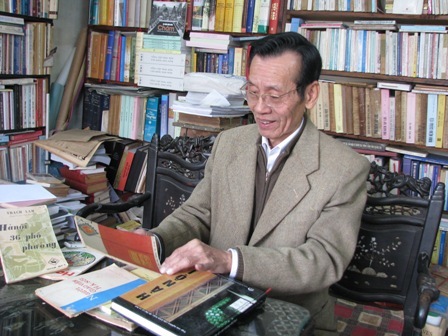 Its easy to find first and second editions of what I'm looking for, and because in Vietnam only several thousand copies of a book are published to distribute throughout the entire country, it is most likely that many of the books he sells are one of a kind. I end up with 4 tall stacks of dusty books placed on his coffee table and am wondering how I'm going to get them home on my motorbike. My worries over this issue abruptly come to an end as a new anxiety arises when we begin to go over prices. Huy Cận. Trời Mỗi Ngày Lại Sáng, NXB Văn Học, 1958. "I'm going to add up the prices now, alright? Each of these books", as he holds up the 36 volumes in the stack, "is 100,000 dong (roughly $5.00 per book)." "No, each of these are 100,000, this other category here is 110,000 and the prices of the books in this stack are all different (up to 400,000 or $20.00)." "Uhm, let me just see how much money I've got here *I take out my wallet, stalling for time and a plan*...let me look through the books one more time, I'll choose the ones I really need and come back next time for the rest." Mr. Cảnh very enthusiastically agrees to keep the mountain of books I impulsively pulled from the shelves in safekeeping until my return ("when do you think you'll come back, by the way?...") and I eventually depart with merely a "hill" of books in an unmarked blue grocery bag. "Well, right now I'm researching about the poet Xuan Dieu"
Overall, this is a great shop. I highly recommend it for the student of Vietnamese or collector of literary works in search of rare titles in acceptable condition. I was disappoined that there were not more foreign titles, considering the number of English speaking customers he most likely serves, but its Vietnam, its Hanoi, and English works are just not a part of the culture here. Nevertheless, I am now the proud new owner of small number of literary treasures which I have been impatiently waiting to share. For more information on Nhà Sách Cũ, email vanpt@fpt.vn, phone (04) 3 827337, or just stop by if you're here in Hanoi at 5 Bát Đàn, located in Hanoi's Old Quarter. """Now you can also find coupon to save your money with Traveloka. This is a flight and hotel booking service that can save you a lot money!